We’re always focused on positioning. Stocks don’t go up because of an article written by a 26-year-old journalist who’s never made a trade in their life. Stocks move based on positioning from institutions. When the market is caught leaning the wrong way, the unwind can create spectacular moves. This is the key to the market. It’s positioning, not the noisy media. As many of you know, every single day I look for risk versus reward opportunities that are skewed in our favor. We’re not here to be right, we’re only here to make money. In other words, we don’t care if we get it wrong. We just want to make sure that when we are right, we’re really really right. Isolating asymmetric risk versus reward opportunities is how we do that, and I believe we do it very well. Which brings me to today’s topic: the U.S. dollar. I really don’t think this market is ready for the U.S. dollar to collapse. The greenback has rallied all year and emerging markets and precious metals have felt the pain. I believe that’s about to change dramatically. When I look at positioning in precious metals, I’m seeing commercial hedgers, the “smart money,” with their largest net long positions of all-time! I wrote about this to Breakout Profits subscribers in a related precious metals trade alert yesterday — the second recommendation I sent this week. Commercial hedgers actually do “hedge” when it comes to gold and silver. They’re almost never ever long and carry a net short position almost 100% of the time. The question is just how short. But not today! Silver hedgers are actually net long over 12,000 contracts, something we’ve never seen. Gold hedgers are net long as well for the first time in a couple of decades. Last time they even came close to being net long was in December 2015, right before we got one of the most violent rallies in precious metals stocks that we’ve ever seen. We laid out the bull case for precious metals here earlier this week. And it’s starting to play out. But what will the catalyst be to take them much higher? I think it’s the U.S. dollar. Remember that the euro represents approximately 60% of the entire U.S. dollar index. Here’s how the euro/U.S. 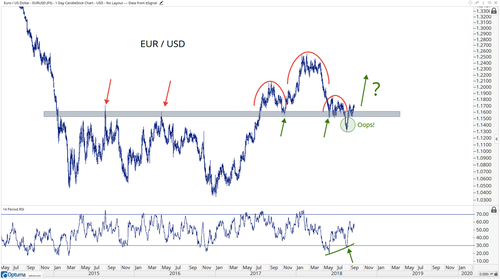 dollar (EUR/USD) chart looks to me. I see a “very obvious” head-and-shoulders top developing over the past year. Head-and-shoulders tops are supposed to resolve themselves to the downside once breaking the neckline, which is the support level at the bottom end of the range. In this case, the neckline is about $115 to $116 in EUR/USD. The problem is that these patterns rarely work out the way the book says they should. In fact, we often get a whipsaw, or brief breakdown, and then an immediate reversal back above the neckline which triggers the face ripper. We got that breakdown in August, right in the heart of “whipsaw hunting season” and now we’re back above key support. I can totally see a rally develop back towards $125 to $126 in EUR/USD. 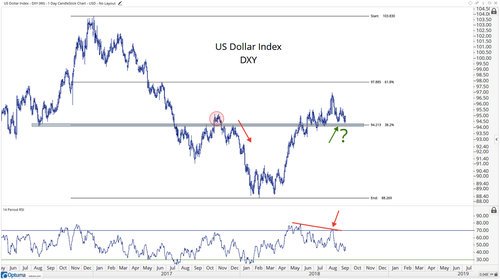 What does that mean for the U.S. dollar index (DXY) itself? It still looks like it’s in no-man’s land. Unless we’re below $94, I see little reason to be short, especially with the repercussions a healthy stock market could have on the yen. For precious metals trades, we want to focus more on the EUR/USD and less on the dollar index itself. Nevertheless, the $94 level is big. A rally in EUR/USD should send the U.S. dollar index tumbling and potentially retesting those lows from earlier in the year. I think a U.S. dollar collapse will catch many off guard. A precious metals rally, emerging market stocks rally and euro rally should all occur simultaneously if this thesis is correct. And if it’s not, our levels are well-defined so that we can live to fight another day. We’re not cult followers like many gold bugs who’ve for years lost tons of money along the way. I think many have just thrown in the towel and given up on the whole thing. We like that. I’m happy to take the other side.